Explorers for oil wells calculate the depth of oil formations in much the same way, using a charge of dynamite in place of an earthquake. Special designed seismographs write the story of the earth waves set up by the explosion and permit the charting of unseen and untouched depths with surprising accuracy. One large oil company employs about a hundred full-time seismograph experts. Most major producing companies have crews at work all year ’round. 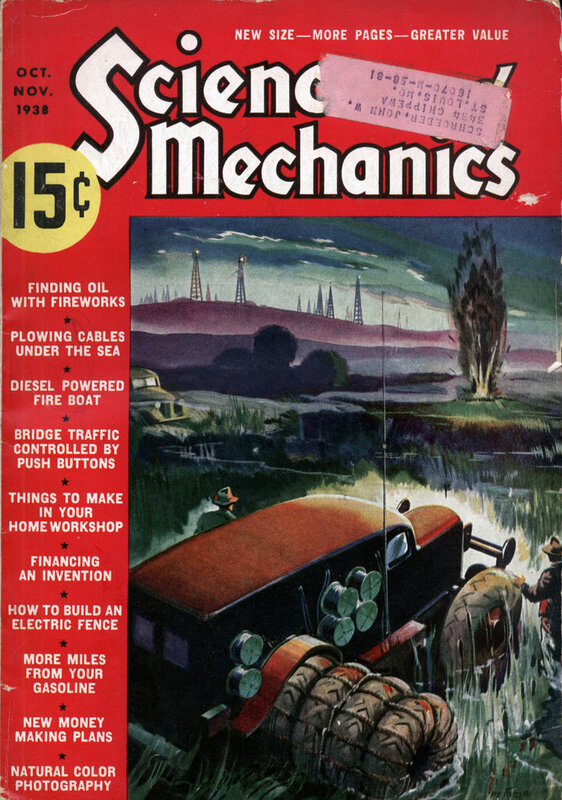 A typical seismograph party includes fifteen to eighteen men; a recording truck and a shooting truck, each marked as explosives carriers; a surveyor’s car; a drill truck with a small rotary drill, and several hundred feet of casing, drill pipe and tamping poles; a water truck, and the chief’s car. After the surveyor determines the elevation, a hole for the dynamite charge is drilled through the surface layer, sometimes as deep as 400 feet. Next the delicate “seisphones” or “geophones” are placed. There are several types of these instruments, the most common containing a small coil suspended in a magnetic field. Any movement of the coil sets up a minute electric current that is carried along to the main recording instruments. In “reflection” shooting, the seisphones will be spotted within a quarter-mile of the dynamite charge. As the explosive wave travels downward, part of its energy is reflected toward the surface by each of the layers that make up the underground formation. The seisphones “hear” these reflected disturbances. The object is to measure the time that elapses between the explosion and the return of the shock from each of the layers below. The depth and slope of individual layers may then be calculated from the time and the known speed of the wave. Another method called “refraction” shooting depends on the fact that part of the shock also travels along each bed at a much higher rate of speed than the rolling ground wave on the surface. Seisphones placed as far as several miles away can pick up the “refracted” disturbance that arrives well ahead of the surface tremblor. Differences in time of arrival of refracted waves recorded at different positions indicate the depth and slope of the layer traveled by the shock. Recording the Shocks The weak current generated by any vibration that moves the delicate coils in the seisphones is carried to the recording truck where amplifiers raise it to a strength that will agitate another coil, also suspended in a magnetic field so that it acts on the principle of the electric motor. A small mirror is attached to this coil and a steady beam of light is reflected from the mirror to a moving reel of photographic film. When there is no disturbance, the beam of light traces a straight line on the moving film, but the slightest shock is instantly translated into sharp zig-zags that gradually straighten again as the tremor dies out. To complete the record a highly accurate timing device marks a line across the film every one-hundredth of a second. Just before the buried dynamite is exploded, the crew stands still, since the seisphones are delicate enough to pick up footsteps. The story written on the moving photographic film by each seisphone shows a series of shocks—waves reflected from different layers and the rolling ground wave. By relating the data from the separate seisphones and by repeated shootings, the depth and slope of each bed of limestone or other rock is calculated, and the subsurface structure is gradually mapped. Instruments Locate Traps The seismograph does not show the location of petroleum itself. It merely shows the contour of layers of rock and thereby indicates whether oil might be trapped underneath. The old mental conception of literal “pools,” that leave an empty hollow underground after the oil is removed, is a fallacy. There is always sand i or rock throughout the structure, even in “pools” or “pockets.” Oil is usually mixed with gas and salt water and tries to work its way upward between sand grains or the pores in permeable rock. Horizontal beds of trap rock hold the mixture of oil, gas and water in layers spread so thin that recovery is impossible. Where the trap rock slants upward to form a closed roof resting on a bulge in the porous material, the mixture can accumulate and the water, oil and gas gradually separate into distinct horizons, with the gas on top and the water underneath. Pockets like this, called anticlines, salt domes or faulted structures, are the object of the oil prospector’s search. They account for about 90 per cent of all the known pools of the world. The seismograph crew is interested in the slope of the underground trap rock. They attempt to measure the direction and degree of slope in a complete circuit around the formation to make sure of a closed pocket. Until recently, oil prospecting was a poor gamble. “Wildcats,” or exploratory wells were drilled on little more than hope. Experts estimate that not more than one of fifty ever pay. Technicians have slowly built the new science of geophysics—the measurement of the physical properties of rocks both on the surface and be- low it. Oil formations sometimes reveal their presence by surface indications but the development of other areas must wait for modern geophysical methods, of which the seismograph is the most important. Reflection seismograph work is the most direct of all geophysical methods. Its accuracy can be checked by shooting around wells already drilled and comparing the results with the actual log of the well. The error in depth is commonly less than one per cent in areas where good reflections can be had. 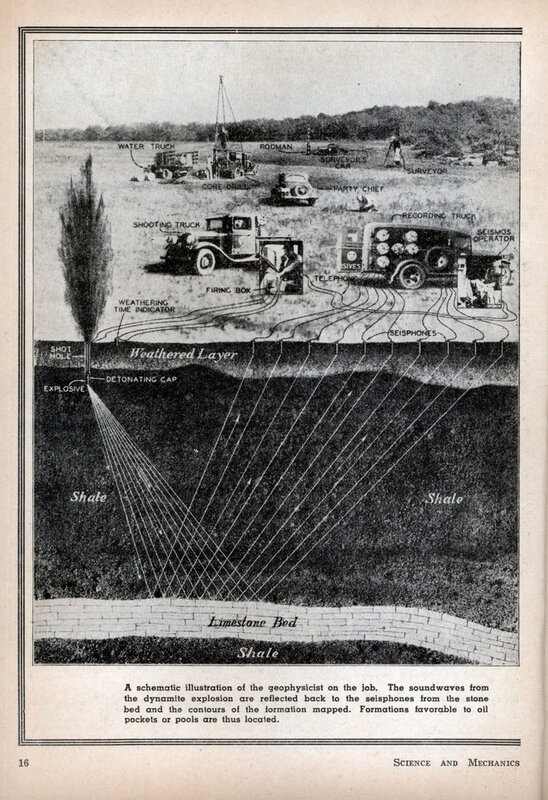 By increasing the size of the dynamite charge great depths can be reached and accurately checked. The world’s record drilling depth was established at 15,004 feet and the seismograph is able to reach several thousand feet below this record. Ordinarily, five pounds of dynamite is enough for one reading. This morning I just read an article about a guy who worked doing the audio/data analysis on this stuff for an oil company. A friend challenged him to build a box “That would let me sing in tune,” and he invented Auto-Tune. I love and hate him for that. Cool article. My great uncle, Emerson G Smith, is the author.